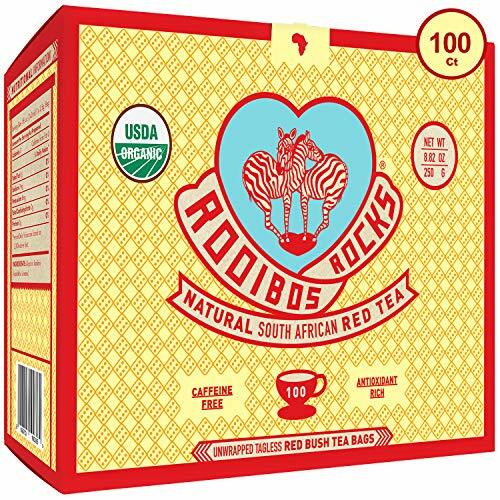 100% NATURALLY USDA CERTIFIED ORGANIC The Rooibos Tea plant grows only in the mountainous Cederberg region of South Africa, using no man-made chemicals or pesticides; farmed in harmony with its surroundings to produce a naturally pure tea with no additives, colorants or preservatives. SUSTAINABLY SOURCED AND FAIR TO ALL Rooibos tea is farmed through a co-operative system, helping indigenous farmers deliver their quality tea to markets around the world. Empowering local communities for generations, the Rooibos tea industry supports thousands of farm workers and their families. RICH IN HEALTH BOOSTING BENEFITS Rooibos tea contains antioxidants including the unique and powerful Aspalathin, which is understood to support your immune system naturally. High in Nutrients and essential minerals such as iron, potassium, zinc and manganese, Rooibos helps promote good health and may reduce the effects of cell damage in the body. NATURALLY CAFFEINE FREE Rooibos tea is naturally sweet and full-bodied, with a unique earthy flavor and rich ruby color. With less than half the tannins of black and green teas, and no bitter after taste, it's perfect for pregnant and nursing mothers and makes a delicious tea for kids.  DITCH THE CAFFEINE JITTERS AND GET A GOOD NIGHTS SLEEP. Perfect as a delicious tasting, naturally caffeine free alternative to Coffee, Black and Green Tea.  SUGAR FREE and CALORIE FREE - A delicious alternative to sugar loaded sodas. Drink Up Guilt Free! Perfect Hot or Iced. Keep a pitcher in the fridge for the whole family to enjoy. :-) Bring the heart of Africa to every kitchen with a gift of our gorgeous Rooibos Tea boxes! They are the perfect present for all tea lovers.  FEEL THE GOODNESS. ROOIBOS ROCKS! Bursting with Powerful Antioxidants that boost the immune system and offer you a cleansing detox.  MAKE A DIFFERENCE and MAKE A CHANGE TODAY. Supporting local tea growing communities, USDA Certified Organic Rooibos Rocks is Sustainably and Ethically Farmed only in the South African Cederberg Mountains.  GREAT VALUE 100 FINEST QUALITY SUPERIOR GRADE ROOIBOS TEA BAGS in 5 foil fresh pouches in every box. Great for Tea Gifts too!